When it’s time to list your home, it’s hard to know where to start. There’s a lot to do to ensure that your home looks it’s best for potential buyers. By taking the time to clean and maintain your home before listing it, you’re more likely to impress potential buyers. 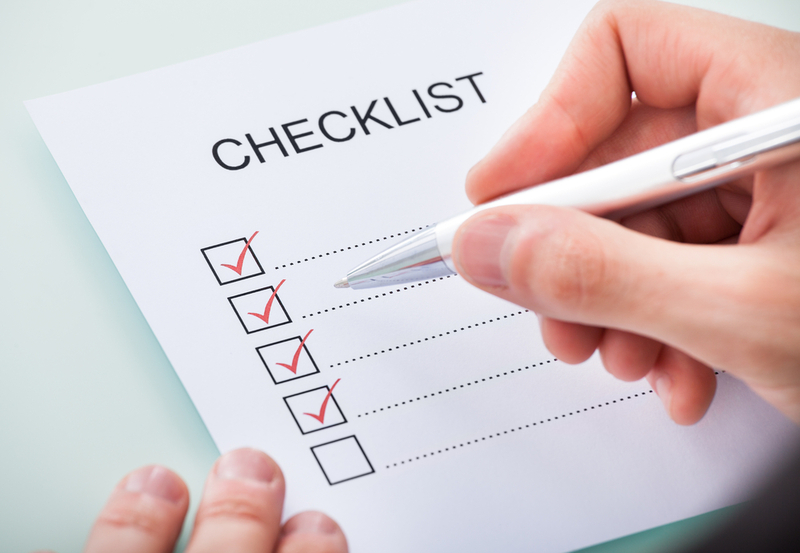 Before putting your home on the market and putting the “for sale” sign on your lawn, use this checklist to prepare yourself and your home. While you’ll need to put forth plenty of time, effort, and a lot of elbow grease, it will be well worth it to impress those looking to buy your home. The idea of listing and selling your home on your own sounds ideal on the surface. You get to pocket all of the cash and you control how the process goes. But, what many people don’t realize is that selling on your own without the help of a real estate agent is no easy feat. Unless you have experience in real estate, your best bet is to hire a local real estate agent that knows the ins and outs of the market and community. With that said, you don’t want to hire the first realtor you come across. Take time to research local agents in your area. Speak to them on the phone. Meet with them in person and go with the agent that makes you feel the most comfortable and has the most experience. Before taking care of the interior of your home, start with the outside. Curbside appeal is a crucial factor in how quickly your home gets off the market. The exterior of your home is the first thing that buyers are greeted with and as you’d expect, people do judge a book by what’s on the cover. Take the time to improve the outside area of your home. Give your lawn a fresh cut. Spruce up the garden by planting new flowers and throwing down a new layer of fresh mulch. Now is also a good time to improve the exterior of your home. Replace any missing siding or clean it to remove dirt and other debris. You may also want to repaint your shutters or front door and apply new stain your porch, deck, or fence. No one likes to walk into a home that feels cluttered. If you have a lot of stuff in your home, consider removing some of it to open the space and make it more welcoming. Be sure to get rid of boxes, toys, and excess furniture that take up space in a room that’s otherwise quite small and enclosed. By decluttering your home, potential buyers can allow their imagination to roam so that they can think about how they will turn the house into their dream home. It’s always nice to walk into a home that smells and looks fresh. A home that looks clean implies that it’s been well taken care of over the years. To really impress buyers, take the time to thoroughly clean the home. Be sure to pay close attention to the kitchen and bathroom. When cleaning, don’t forget about your appliances, windows, and doors. If you have stainless steel appliances, wipe them down to remove dirt and fingerprints. You’ll also want to wipe down your windows and patio doors using window cleaner or a solution of warm water and vinegar. Everyone has different tastes and likes when it comes to interior design. One of the easiest and least expensive changes you’ll want to make to your home before listing it is to neutralize it. To start, paint the walls with a neutral color. Repainting walls with a neutral color makes the space more of a blank canvas for potential buyers. A fresh coat of paint will also hide any marks or stains on the wall. Are you unsure of which neutral color works best for your home? Gray has been a trending color for the last few years. Gray can make a space feel warm or make it appear more open and airy. If you’re looking to sell your home quickly, you may benefit from hiring a staging company. These companies specialize in making your home look appealing, warm, and welcoming for potential buyers. Staging services aren’t cheap but they can come in handy if you want to list your home and have it sold within a short time span, usually a few weeks! The first step in successfully selling your home is to take time to prepare it to be listed on the market. Be sure to keep these tips in mind to make your home more appealing to potential buyers. Have you ever sold a home before? What tips can you give homeowners to prepare there house to be sold? Leave a comment with your best advice in the section below.